sports university to make a global impact. Clients of the Academy have included central sports organizations (CSOs, such as ministries of youth and sports), national Olympic committees, ministries of education (for physical education and interscholastic sport programs) and sport associations and federations. 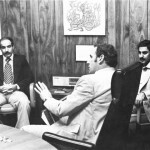 Beginning with an international education and training program with the State of Bahrain in the Arabian Gulf in 1976, the Academy’s international impact now includes some 50 Protocols for Cooperation with sports organizations or institutions of higher learning around the world. The Academy has been able to provide vast expertise expected from a sports university combined with the experience gleaned from applying this expertise in the field, and stands ready to help additional clients meet their sport education needs. 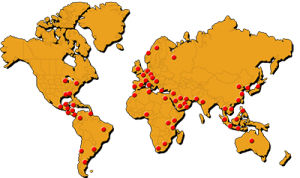 The Academy has delivered a wide range of quality sport education programs throughout the world. 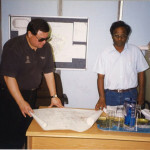 These have included special seminars and symposia, certificate, certification such as the International Certification in Sports Coaching (ICSC) and Sports Management (ICSM), International Diploma (IDSM-Sports Management, IDSC-Coaching), and Physical Education (IDPESC) as well as the institution’s degree programs. Mexico – Ministry of Sports (via The University of Chihuahua): ICSC and ICSM programs. Bahrain – General Organization for Youth and Sports. ICSC and ICSM programs. 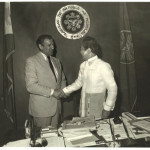 Philippines – Office of the President; (via University of Life). ICSC and ICSM programs. 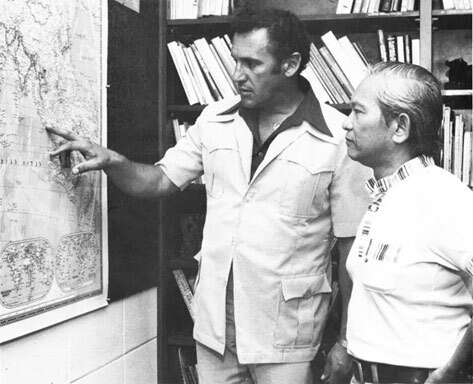 Malaysia – Sabah Foundation. ICSC and ICSM programs. Singapore – Singapore Sport Council. ICSC and ICSM programs. Malaysia – Majlis Sukan Nasional. ICSC and ICSM programs. 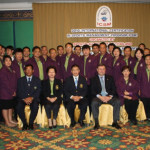 Thailand – National Olympic Committee. ICSC and ICSM programs. 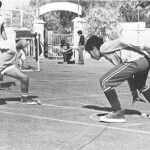 Egypt – Supreme Council for Youth and Sport. ICSM program. 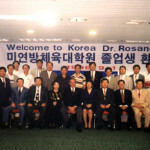 Korea – The Academy organized the Korean Special Project that ultimately awarded over 50 doctoral degrees to Korean students who represented virtually every Dean of Physical Education in the university system of that nation. 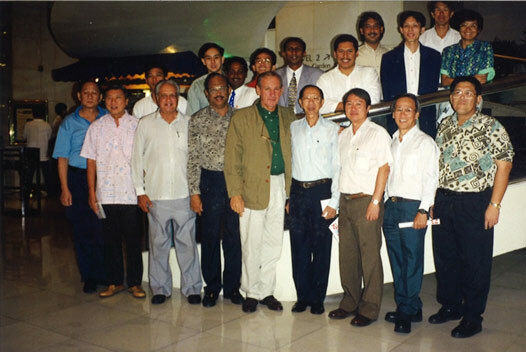 Singapore -USSA – Alumni Association. ICSM program. 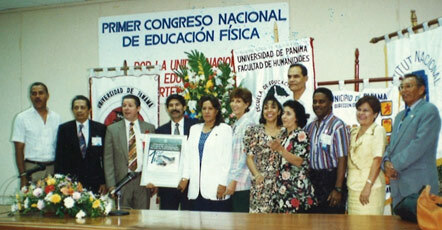 Panama – University of Panama. ICSM program. 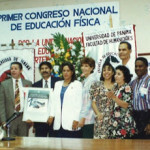 Mexico – University of Tamaulipas. ICSM program. Hong Kong – Sport Federation & Olympic Committee of Hong Kong China. ICSC and ICSC programs. 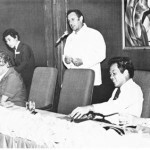 Aruba – National Olympic Committee. ICSC program. Botswana – Botswana National Sports Council. ICSM and ICSC programs. 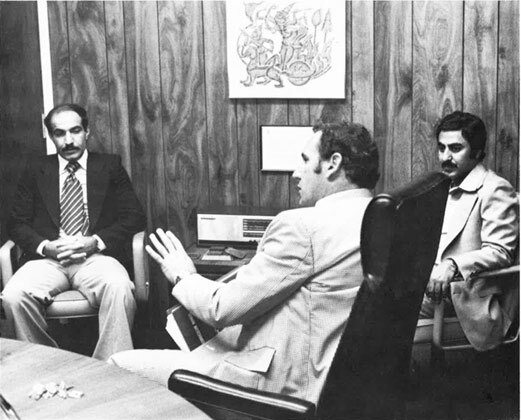 Bahrain – General Organization for Youth in Sports and National Olympic Committee. 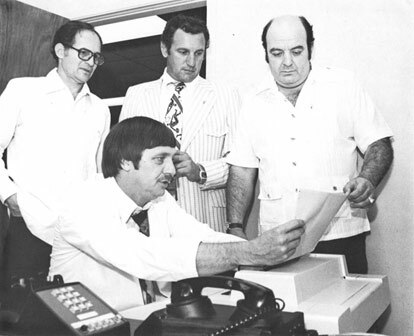 Taught the ICSM, ICSC and/or diploma programs and conducted specialized clinics and seminars, undertook studies and other consulting work to support the national sport effort. Bahrain – University of Bahrain. 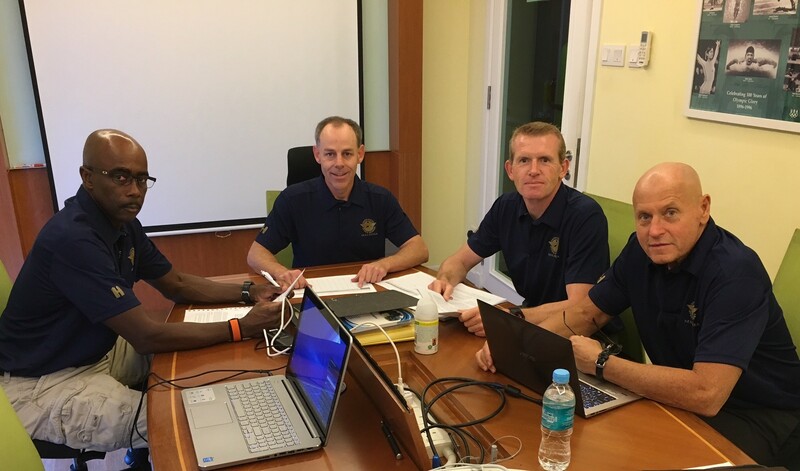 The Academy provided adjunct faculty to teach sports management on the campus of the University of Bahrain and educated three doctoral students who upon graduation became the nucleus of the faculty of sport management at the University. Taiwan – The Academy conducted a special doctoral program similar to that of the Korean Special Project which ultimately resulted in more than 20 Taiwanese students receiving doctoral degrees from the Academy. Thailand – Sport Authority of Thailand. 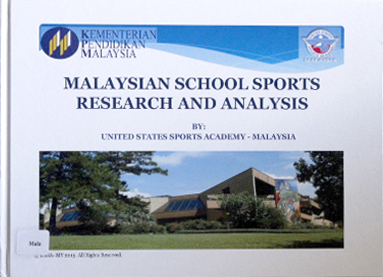 ICSM and ICSC programs in Bangkok and arranges an annual sport study tour of sports in America. 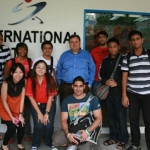 Singapore – International Sport Academy – Singapore. ICSM, ICSC and diploma programs and periodic specialized seminars. UAE – The Academy taught its ICSC and ICSM programs in Dubai and Abu Dhabi to various groups and individuals through a private concern. Jamaica – University of Technology. ICSM program. 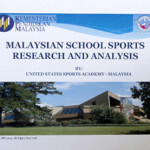 Malaysia – Institute Sukan Nacional (ISN).  ICSC, ICSM and Sport Diploma programs. China – Shaolin Temple. The Academy has been teaching a special course on the Philosophy of the Shaolin in an online environment and will teach the course on-site in Malaysia and China in the coming year. Malaysia – Ministry of Education. International Diploma in Physical Education and Sports Coaching to more than 700 teachers per year. 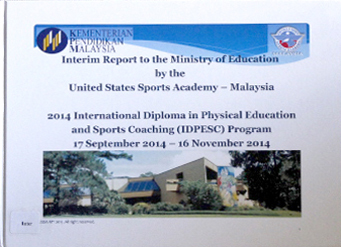 CLICK HERE to watch a video from the 2014 Malaysia IDPESC program. China – Shanghai Administration of Sports. International Diploma in Sports Coaching for 100 high performance athletes and Olympians. China – Run with the Sports Institute of Henan University. International Coaching Certificate program. CLICK HERE to watch a video from the 2015 program. Thailand – Sports Authority of Thailand International Certification Program with site forums and study tour in the United States. Thailand — Academy hosts students from the Sports Authority of Thailand (SAT) International Certification Program to participate in the SAT Sport Study Tour for the 10th consecutive year, providing an in-depth look at American sports programs and facilities. 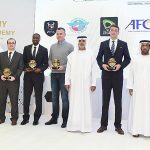 United Arab Emirates — The United Arab Emirates Football Association (UAEFA) and the United States Sports Academy opened the UAE Football Association Academy for Sports Management (FAASM) to enhance the success of football (soccer) in the region through the development of soccer administrators in the UAE. Shanghai, China – The United States Sports Academy educates 100 former elite athletes for careers in coaching as part of the Academy’s International Diploma in Sports Coaching (IDSC) program with the Shanghai Sports Bureau and Shanghai Administration of Sports (SAS) in China. Top students come to the Academy for a study tour. 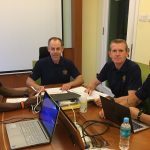 Thailand — Academy continues long-term project with Sports Authority of Thailand (SAT) to prepare students for sport leadership through the International Certification Program. This includes SAT Sport Study Tour of American sports programs and facilities. Thailand — Academy works with Sports Authority of Thailand to add new National Sports Coaching Program (NSCP) certification program to meet the advanced needs of Thai coaching professionals. This includes coursework in Thailand and a practicum in the United States. United Arab Emirates — Academy and the United Arab Emirates Football Association (UAEFA) continue their partnership through which the UAE Football Association Academy for Sports Management (FAASM) to enhance the success of football (soccer) in the region through better education and development of soccer administrators in the UAE. Shanghai, China — Academy conducts International Diploma in Sports Coaching (IDSC) program with the Shanghai Municipal Authority of Sports (SMAS) that prepares former elite athletes for careers in coaching, a program begun in 2014. Top students come to the United States for a mentorship. 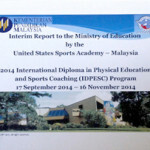 Malaysia — Academy continues International Diploma in Physical Education and Sports Coaching (IDPESC) program in Malaysia that has trained thousands of teachers in critical physical education and coaching skills since 2012. The Academy’s “Train the Trainers” (TOT) program assists the Malaysian government in its National Service Training Program (NSTP) for youth. Singapore — The Academy marks 15th year of offering certificate, certification and diploma programs in cooperation with the International Sport Academy of Singapore (ISAS). 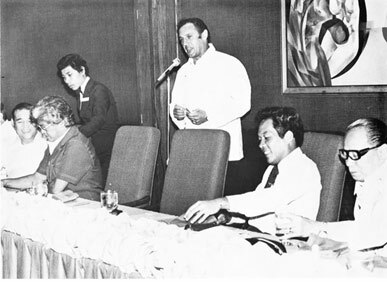 Academy President Thomas Rosandich addresses the Philippine Olympic Committee on the goals of the International Certification programs in sports. Minister of Sports Guillermo Lopez Portillo (right) explores the function of the Academy Human Performance Laboratory. 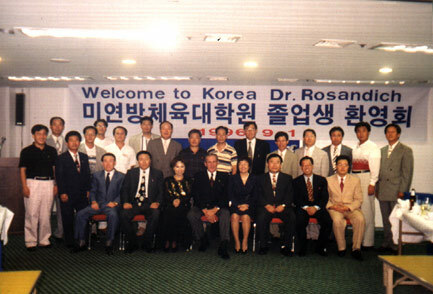 The USSA- Korea Alumni Association gathers to greet Academy President Thomas Rosandich to Seoul in 2004. The USSA-Singapore Alumni Association gather for a program planning meeting. 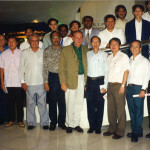 The Association sponsored the delivery of the ICSM program in Singapore for 8 years. Faculty from the University of Panama participate in the Academy’s ICSM program. A meeting of the Bahrain Alumni Association taking place in Manama. The Botswana National Sports Council discuss the Academy’s programs at a meeting in Gabarone. 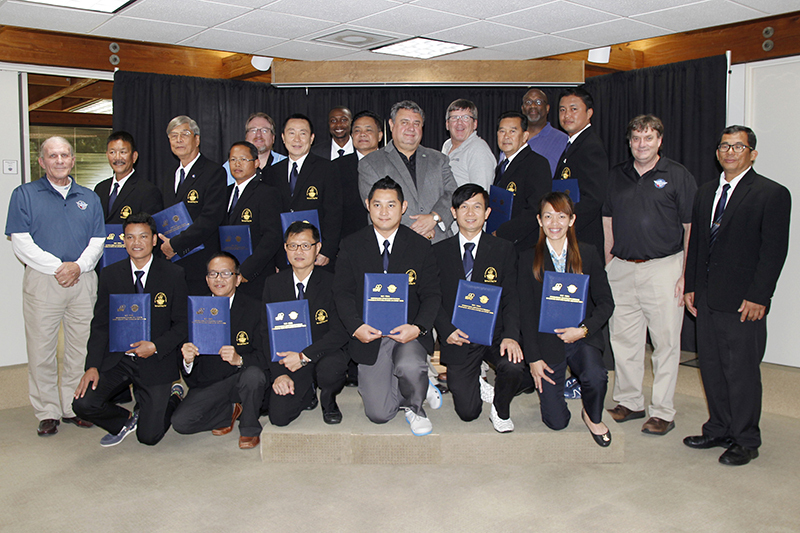 Graduates of the Academy International Diploma in Sports Management program show off their diplomas. 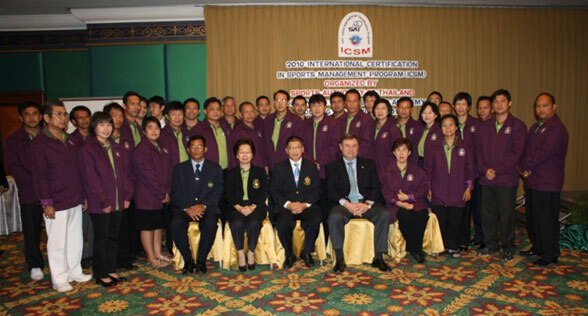 Students from the Sports Authority of Thailand participate in the 2010 ICSM program in Bangkok. 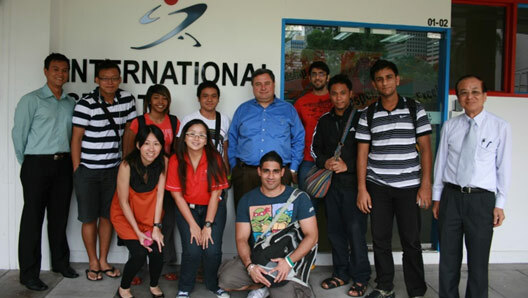 Students enrolled in the Academy’s International Diploma program on the campus of the International Sports Academy – Singapore. Shaolin Temple Abbott Shi Yongxin and Academy Vice President Dr. T.J. Rosandich sign an agreement for the teaching of the Shaolin Philosophy course. The Academy has been re-training more than 700 teachers each year in physical education and sport coaching skills. Shanghai Administration of Sports Vice Chair Dr. Guo Bei and Academy Vice President Dr. T.J. Rosandich sign an agreement for the delivery of the Academy’s International Diploma in Sports Coaching program. 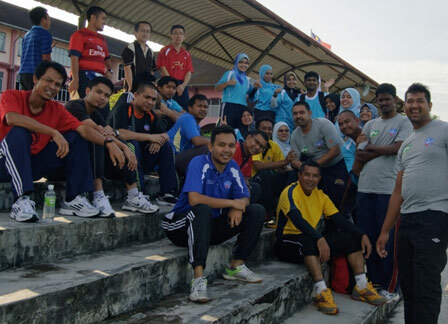 The Academy completed the third year of a major program in Malaysia with the purpose of retraining approximately 55,000 physical education teachers in key areas of sport. Sports Authority of Thailand International Certification Program Graduation Ceremony 2015. Academy hosts students from the Sports Authority of Thailand (SAT) International Certification Program to participate in the 2016 SAT Sport Study Tour. 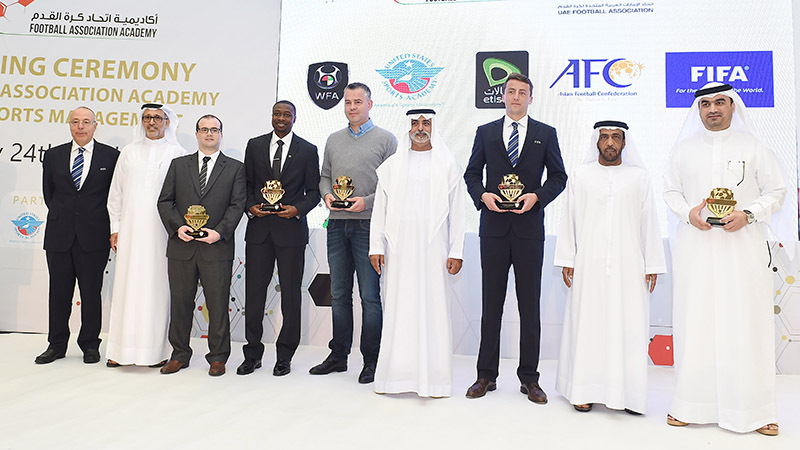 The United Arab Emirates Football Association (UAEFA) and the United States Sports Academy opened the UAE Football Association Academy for Sports Management (FAASM) to enhance the success of football (soccer) in the region. The Academy educated 100 former elite athletes for careers in coaching as part of the Academy’s International Diploma in Sports Coaching (IDSC) program with the Shanghai Sports Bureau and Shanghai Administration of Sports (SAS) in China. The Academy has developed a physical fitness test battery that has been used to assess the very young to the very old. The Academy has also undertaken a variety of special studies to help governments and policy makers chart a course for their national sport efforts. Bahrain-General Organization for Youth and Sports. 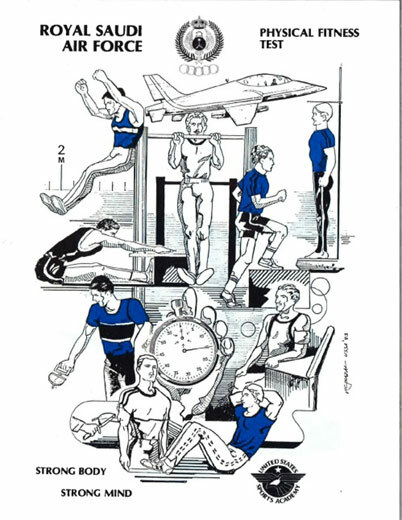 developed the Physical Fitness test used until this day (with some modifications) and tested every school age child in the country. First complete physical profile of the nation’s youth. Kenya – Ministry of Youth and Sports. The Academy conducted a feasibility stady for the Kenyan Government to host the World University Games. Saudi Arabia – Royal Saudi Air Force. The Academy did physical fitness testing on thousands of military personnel annually utilizing the test developed in 1977 for Bahrain and reported the results to the Commanders. Saudi Arabia – Royal Saudi Air Defense Force. The Academy did physical fitness testing on thousands of military personnel annually (as per the above). Oman – Ministry of Education. Provided an assessment of the national sport infrastructure and programs and prepared a master plan for sport development for the country. Malaysia – City of Kuala Lumpur and Badminton Association. ICSC and ICSM programs. Bahrain – Ministry of Education. Academy faculty supervised physical fitness testing, data analysis and reporting on over 35,000 Bahrain school children. Bahrain – Ministry of the Interior. A team of four faculty supervised physical fitness testing on thousands of police officers, reduced and reported the results. Gabon – Office of the President. Legacy study and report on the facilities erected for the Cup of Africa Nations Football Tournament. Malaysia – Ministry of Education. 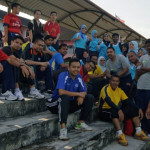 Physical Fitness testing and reports on more than 100,000 Malaysian school children. Gabon – Office of the President. Completed an assessment of the national sport effort of the Republic of Gabon and based on the findings, the Academy is currently planning the development of a National Sports Academy which will be implemented in 2015. Bahraini school children undergo fitness testing by Academy staff. The Academy tested over 75,000 school children and produced the first physical profile of Arab youth in the Arabian Gulf Region. 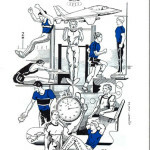 The test manual for military physical fitness testing that served as a guide for physical assessment of thousands of Saudi military personnel. Academy faculty demonstrate the physical fitness test battery to Bahraini police exercise leaders. Academy faculty conduct an in-service training session for Bahraini Physical Education teachers on the administering of the physical fitness test battery. 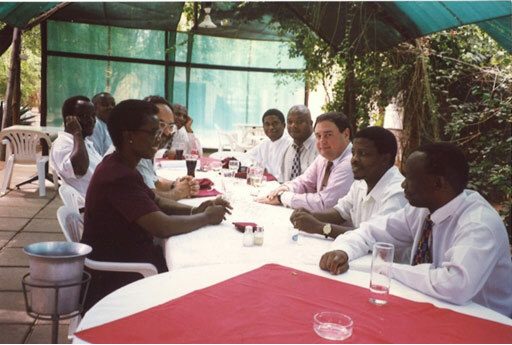 Gabonese President Ali Bongo Ondimba greets the Academy study team at his residence on an off-day. Ministry of Education. Physical Fitness testing and reports on more than 100,000 Malaysian school children. Over the decades, the Academy has helped sports organizations of all types to develop effective and comprehensive sport programs. These have varied in size from those requiring hundreds of personnel to a few, specially targeted disciplines. Bahrain – General Organization for Youth and Sports. Full- charge conduct of the nation’s national sports effort including sports medicine and human performance research laboratory. 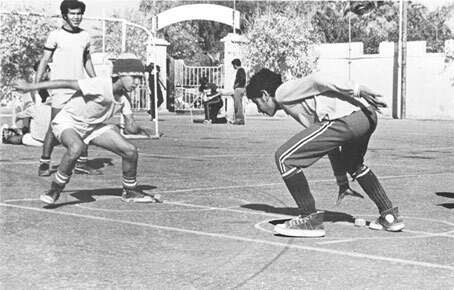 Kuwait – Supreme Council for Youth and Sport. The Academy provided a team of coaches as well as sports medicine and strength coaches to support the national sport effort. Philippines – Office of the President. 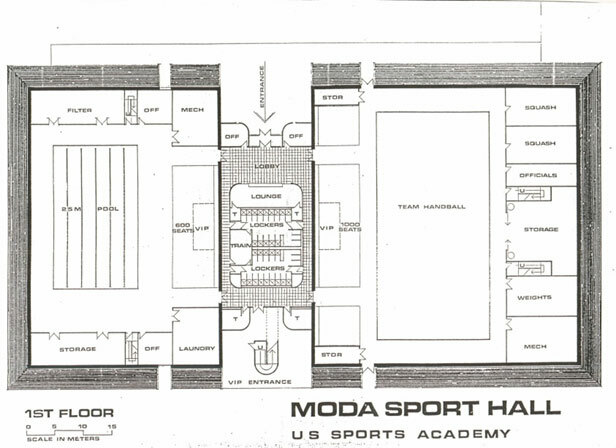 The Academy provided training to various sports coaches or directly coached sports with terms of service varied. 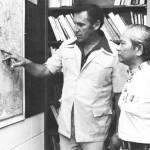 Malaysia – Sabah Foundation. 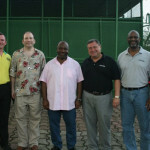 Provided a team of four coaches and a sport medicine specialist. Brunei – Ministry of Culture Youth and Sport. 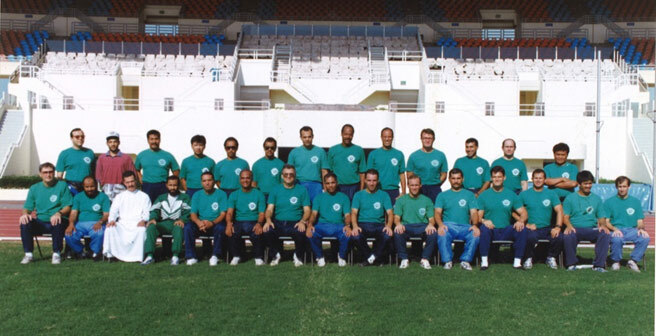 Provided six coaches to work with the national teams. Indonesia – Komite Olahraga Nasional Indonesia. 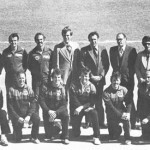 Provided a team of four coaches to work with various national teams. Malaysia – Majlis Sukan Nasional. 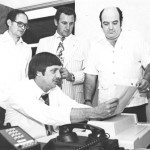 Provided various coaches and sport specialists for varying lengths of time. Saudi Arabia – Ministry of Defense and Aviation (MODA). Undertook a study and developed a master-plan for sports facility development. Saudi Arabia – Royal Saudi Air Defense Force. 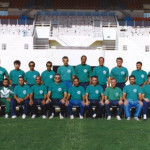 At its peak the Academy had approximately 120 coaches working in seven different cities in the Kingdom coaching approximately 20 sports and activities. Saudi Arabia – General Presidency of Youth Welfare. Recruited and provided national coaches for various sports. 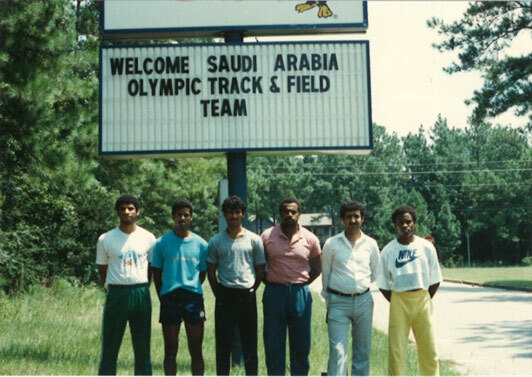 Also arranged training camp in the United States for Saudi Olympic Teams in preparation for the 1984 Olympic Games and conducted various clinics and seminars of varying lengths during this period. Oman – Ministry of Education. 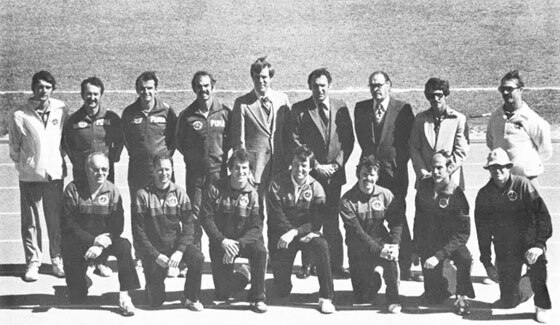 Arranged training camps in the United States for the Olympic teams in preparation for the 1984 Olympic Games. Brunei – Ministry of Culture, Youth and Sports. Provided the national swimming coach. Botswana – Botswana National Sports Council. 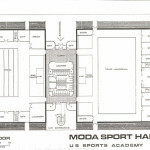 Design review of the Molepolole Sports Complex and a feasibility study for the development of a National Sports Academy. Bahrain – Ministry of Education. Provided a team of four faculty to rewrite the physical education curriculum for primary through secondary school levels. Also developed a plan for a seasonally based, year-long interscholastic sport program. Bahrain – Ministry of the Interior. A team of four faculty to delivered physical Fitness, sport and recreation program to the nation’s police forces as well as training exercise and fitness leaders. Malaysia — The United States Sports Academy launches a pilot project with Malaysia to enhance the nation’s National Service Training Program for youth who have completed secondary school, with the Academy training trainers and developing course materials. The program covers areas such as physical fitness; sport and recreation; nationalism; and military drill and ceremony. Beijing, China – United States Sports Academy President Dr. T.J. Rosandich facilitated soccer matches between the women’s teams of Duke University and Beijing Normal University in China in conjunction with the Federation of University Sport of China (FUSC) efforts to promote and expand sports in China. 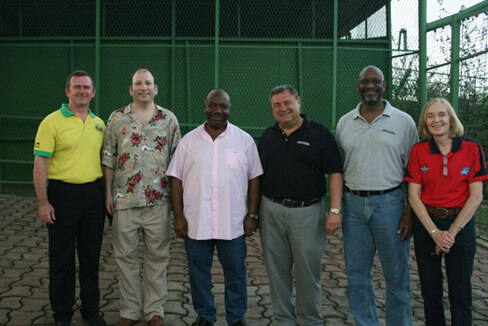 Gabon – The United States Sports Academy signs a new five-year cooperative agreement to work with the central African nation of Gabon to strengthen the country’s national sports program, including youth sports, sport facilities, national teams, and strength and conditioning. 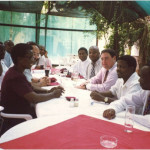 Senegal – The Academy and the Republic of Senegal enter into discussions for the Academy to do a comprehensive assessment of Senegal’s national sport program as well as consideration for how the Academy’s international education programs may be used as a tool for sports program development there. 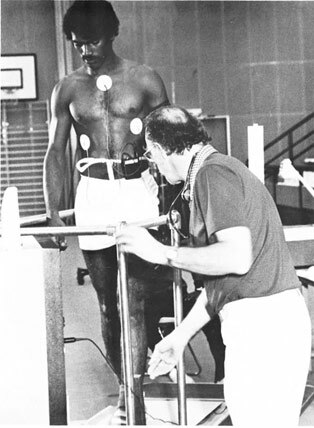 Exercise Stress testing conducted in the first human performance research lab in the Arabian Gulf region. The Academy team sent to Bahrain to undertake duties in running the national sports effort. Academy President Dr. Thomas Rosandich briefs Kuwaiti officials on the program planned for Kuwait. 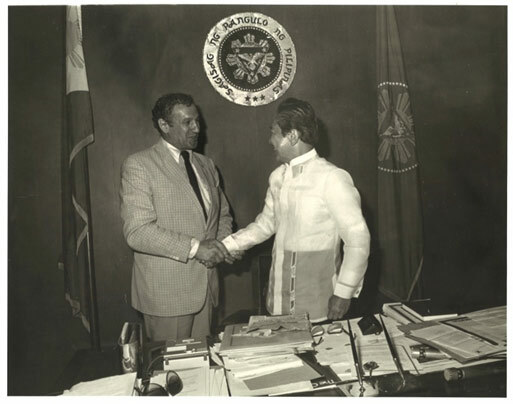 Philippine President Ferdinand Marcos greets Academy President Thomas Rosandich at Malacanang Palace in Manila. 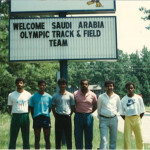 Athletes of the 1984 Olympic Saudi Athletics Team on the Academy campus as they prepared for the Los Angles Games. 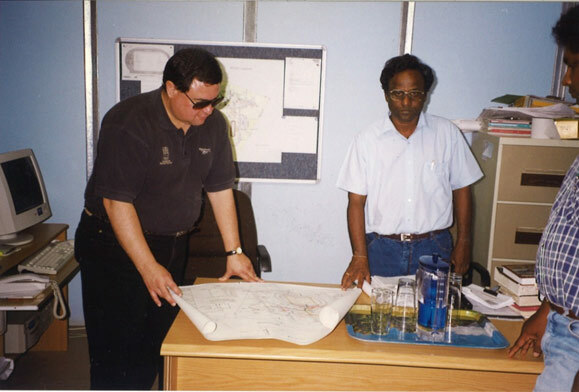 Academy Vice President Dr. T.J. Rosandich reviews facility plans for the Molepolole Sports Complex in Botswana. 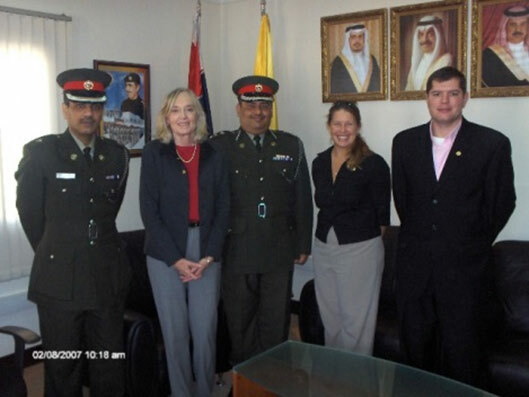 Academy faculty join the Commander of the Bahrain national police in Manama. 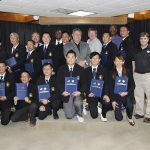 The United States Sports Academy launches a pilot project with Malaysia to enhance the nation’s National Service Training Program for youth who have completed secondary school, with the Academy training trainers and developing course materials. 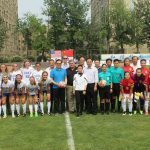 The United States Sports Academy facilitated soccer matches between the women’s teams of Duke University and Beijing Normal University in China in conjunction with Federation of University Sport of China (FUSC). We are proud to announce our new relationship with the European College of Sport Science (ECSS). 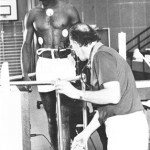 The European College of Sport Science is an international non-profit organization founded in 1995. Its purpose is the promotion of science and research, with special attention to the interdisciplinary fields of sport science and sports medicine. For more information on the ECSS please visit their website.